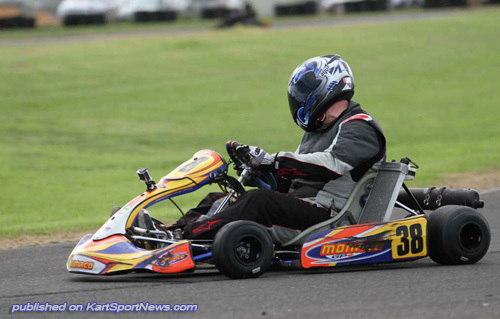 Round 2 of the 2014 Austrans Victorian Country Series was run on the 13th of April at the Warrnambool Kart Club. The weather was great with the predicted rain keeping away for the entire weekend. Once again entry numbers were good with nearly 160 entries received. There were many prizes handed out to competitors in the early entry draw on Sunday morning. These prizes will continue over the series, proving that it is always worth making sure that your entry is in by the Wednesday night. The racing format was once again the popular final only counts for the days results. But with all heat and final points counting towards the end of the series, the drivers had to be both aggressive and calculated. The first class to hit the track for the day was TAG Restricted Heavy. It was to Anthony Warner who would dominate the class with 3 from 3 in the heats and final. Both Craig Widgery and Barry Clough continued their strong performances form the first round to finish second and third respectively. The Cadet class would again prove to be the biggest class on the day with a field of 20. Kai Allen had a very strong performance over the course of the day with win in the second heat and a win in the all-important final. Kacey Mann moved steadily up the order in the final to finish second with Corbin Bailey crossing the line in third. TAG Restricted Light had an action packed final with plenty of passing and drama throughout. It was Jake Hose who emerged at the end of the race to recover from 2 poor heat results with the win. Joseph Clough moved up to second with Tim McCarthy in third place. Once again Dylan Hollis took a clean sweep in Junior Clubman. None of his rivals could get close to him as he simply stamped his authority on the class. Mithchell Mackay recovered from a 2nd heat DNF to grab second place in the final with Nicholas Carroll coming home third. A small but competitive class of TAG 125 Over 40’s faced the starter with George Johnson and Mark Newman fighting it out for the win all day. In the end it was Johnson who got the upper hand ahead of Newman and Kevin Hitchcock in third. In the Clubman Over 40’s it was Leon Forrest who would take the victory by a comfortable margin in all 3 races. Andrew Stubbs would finish the day in a strong second with Mark Rogers coming out on top after having a good battle with Mark Cottrell for third. The Rookies had yet another strong field but the first place result was the same from round 1. Jack Hutchins did take the win, but it wasn’t exactly easy. Hutchins started from grid 7 in the final and drove superb to take the win. Nicholas Schembri had a good consistent day to finish second. Nikki Watson drove from the middle of the pack in the final to finish in third place. Chris Thomas had a day long battle with Andrew Cash for the win in Clubman Heavy. The pair traded heat wins but it was Thomas who would take the win in the final from Cash. Heath Jelbart recovered from a heat 2 DNF to finish in third. In TAG 125 Light Luke Bergens was the class of the field starting from pole and taking the win. Harley Benson gave chase early but eventually had to settle for second with Daniel Wallis rounding out the top 3. It was Junior National Light that had possibly the most nail biting finish of all the finals. Dylan Hollis and Thomas Hughes diced throughout the final with both drivers making some great passes. Thomas made his final move on the last corner to take the win from Hollis. Lachlan Fitchett was to finish in third place. Scott King took a clean sweep of wins in TAG 125 Heavy. 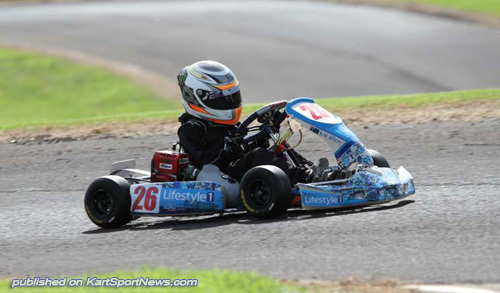 Corey McCullagh fought his way back from 2 heat DNF’s to take second spot from Jack Woodfall who drove well for third. In Clubman Light Kyle Rethus did what he does best, took another clean sweep. Rethus once again looked superb on the circuit dominating the class. This time it was Bradley Marsh-Stepney who came home second from Matt Maher in third. The third round of the series moves to Wimmera on May the 18th.